Beginners lack the experience (this applies to any field from tennis, music, and driving to building successful websites) and thus make mistakes. Your passion will give you energy and commitment to push through the temporary setbacks that happen to every business and even to experienced people. If you start a website writing articles about a topic that doesn’t interest you and there’s not much success at the beginning, you may lose the motivation that you’ve built up following the ideas from the previous step / article. 2. Building a successful website and earning at least $500 per month takes, on average, around 6 to 12 months. Your passion will help you to keep building quality content and promoting your website even if there may no immediate, obvious results. Search engines like Google and Yahoo give a lot of importance to the age of your website. When your website is still “young,” it is unlikely that it will get a lot of free traffic from search engines. As soon as you break the one year age, things change. Your passion and motivation to become financially independent will push you through this one-year “hump” stage, after which your traffic and earnings may start to increase rapidly every month. 3. When you are passionate about a subject, you soon become an expert on that topic. Your expertise will show through your writings and distinguish your website from the thousands of useless websites written by ghost writers hired to write about a topic based only on a few keywords. Your expertise will provide visitors with great benefits, so they will often come back to your website for new advice. They will also spread the word by linking to your website (if they have their own blog or website) or by recommending your website to their friends. The latest search engines’ technology – especially Google’s – is able to determine the relevancy and expertise of the pages by looking at all the keywords in the page. If you really know the subject, you will include words in the page that non-experts don’t even know about. Google will be able to recognize this and reward you with higher rankings. 4. You cannot succeed in business, whether offline or online, on your own. You need business associates; if you are passionate about and experienced with your topic, other experts will quickly recognize this and be willing to partner with you. Of course, you will always find immature business people who will think that you are their competitor. The fact is, cooperation ALWAYS brings much better results to both parties than competition. Remember, you have no competitors, only potential business opportunities. 5. Passion for and expertise with your topic will create a large following among the visitors to your website. They will trust you and will be willing to buy any future products that you may develop. You can also recommend other people’s products and earn commission by referring your trusted visitors to them. The hundreds and thousands of visitors who come to your website daily will test your advice in real life and soon discover whether you really know what you are talking about. it is only by being passionate about and experienced with your topic that you’ll be able to help solve other people’s problems and, in return, gain their trust so that they will help grow your income by coming back again and again. My passion and expertise is tennis. I have been playing tennis for more than 20 years and have been a professional tennis coach for 12 years. I am most passionate about the mental part of the game, so I chose this niche as the topic for my website. I decided to write an ebook about the mental game and sell it on my website. The ebook didn’t earn me millions of dollars 😉 but it did pave the way by showing other tennis webmasters and the hundreds of visitors who bought it that I know my stuff. This helped me grow my subscriber list and establish good relationships with other tennis websites which, in return, link to my website and send visitors to it. I later created a survey and found out that more than 50% of the visitors who come to my website want to learn tennis strokes through instructional videos. In response to this desire, I created “How to play tennis” videos for tennis beginners and doubled my monthly income from my tennis website. I plan to create another video based-product in the near future for more advanced players. I agree that you must let your passion lead you in your business. Passion fuels you when the going gets rough! 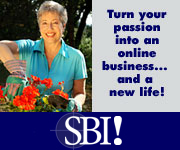 Excellent post, your blog is great for those of us starting out with SBI. I come here when I run out of gas and it always gives me perspective. FYI – try downloading the Askimet anti-spam wordpress plugin to kill comment spam.